Microsoft Research has shown off a new VR/AR technology which is a novel form of mixed reality or would bring some of the advantages of AR to the VR world. Instead of showing users the video of a head-mounted camera, with Remixed Reality they see a live 3D reconstruction, captured through multiple external depth cameras. This approach enables changing the environment as easily as geometry can be changed in virtual reality while allowing users to view and interact with the actual physical world as they would in augmented reality. 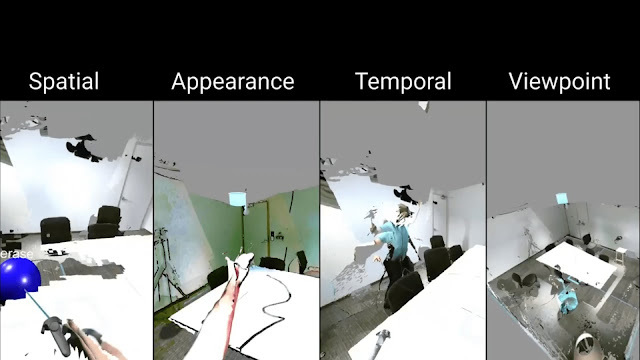 Users characterize a range of manipulations that are possible with Remixed Reality: spatial changes such as erasing objects; appearance changes such as changing textures; temporal changes such as pausing time; and viewpoint changes that allow users to see the world from different points without changing their physical location. The researchers describe some applications such as relive meetings, room remodelling, Occluded reaching, etc. Remixed Reality can also be used for remote interactions.